Head to the Signature Gallery in Kendal this summer to see local artist David Almond’s fantastic new exhibition – ‘PLAY’ by Blok Abstract. David created the Blok Abstract style in 2015, having spent 15 years experimenting with different styles. Blok Abstract aims to avoid a ‘flat’ canvas by using a combination of paint and children’s building bricks. Each piece in the ‘Play’ collection is carefully considered to create a balanced creation. His work is original, colourful and – through the use of children’s bricks – conjures a sense of nostalgia. David Almond successfully studied art at Kendal College. 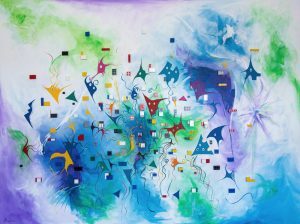 Following his studies he suffered with two distinct bouts of Paranoid Schizophrenia and attributes the Blok Abstract style to this illness opening up his mind. The ‘Play’ exhibition promises to be an original and colourful collection and we can’t wait to see it. 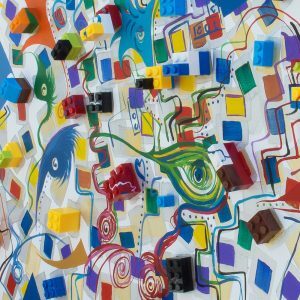 ‘Play’ is a great exhibition to introduce children to the world of art and children’s bricks will be available for children 3+ to play with.